It is still dress up time around here and I have put together a few new fun ensembles for the doll cabinet. Above are two Momoko dressed in a variety of items, most of which is from Sekiguchi. The striped bag is from La Boutique. The brown shoes were originally from an Only Hearts doll set. Below is a Pure Neemo decked out in all kinds of different Azone pieces. It might be a little hard to tell, but she has a sword. These dolls have a ton of articulation and are always fun to pose and dress. Support an artist! Visit my Etsy shop. You can also follow my Instagram, Twitter, Facebook, and Pinterest pages. It's dolly dress up time! I finally decided to go through the scary room of doll boxes, get organized, and scale down the collection. In the process, I pulled out some of my dolls and played dress up with items I want to keep. I realized I haven't really dressed dolls for fun in years. A large portion of my collection is used as models for fashions in the Etsy shop and they do not get much use otherwise. Above is a Petworks Momoko in the vintage 1960s Red Flare Barbie outfit. It's a little big, but I LOVE the combination. 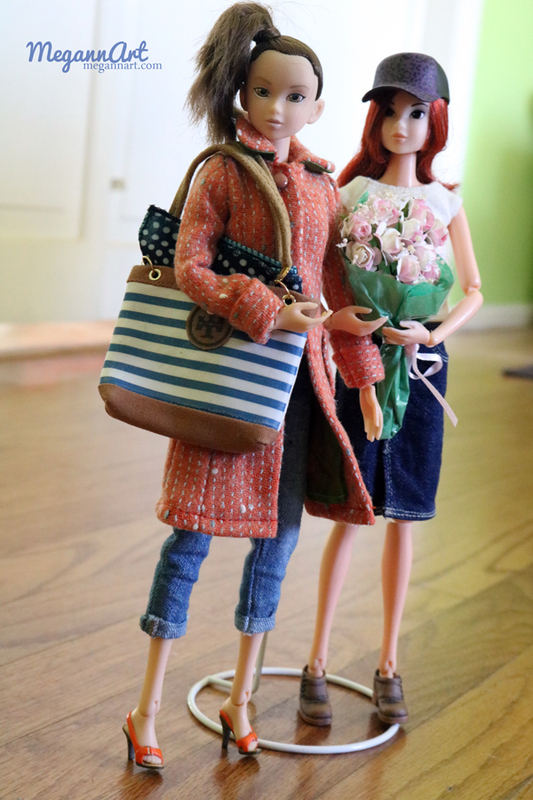 Below are two Momoko dressed in lots of different pieces from Sekiguchi, Clear Lan, Azone, and Petworks. It feels like it took me ages to finish this wonderful set, but it was worth the wait. I found this calico print in my stash of fabric and wanted to make a simple Momoko dress out of it. The dress has pintucks in the skirt and an unfinished ruffle on the bottom. The cardigan is light blue with navy blue trim hand-sewn along the neckline. To finish the outfit, I attached a gold dragonfly to the cardigan. The set also fits a variety of other dolls, including Poppy Parker, Misaki, Jenny, Liv, Tiny Kitty (pictured below), Victoire Roux, and Color Infusion/Jem. Grab one in the shop while they're still available. This year at IFDC 2017, I had the pleasure of seeing some allnurds merchandise in person! Oh my gosh, I love being one degree closer to all the lovely things that I see in Japanese doll mooks. I seriously LOVE this outfit. I accessorized the blouse, skirt, socks, and bag with a pair of Momoko sneakers, Momoko hat, and Dynamite Girls sunglasses. Dolly Bureau books have a few patterns for Momoko, but I think this is one is my favorite. The set is a jacket, skirt, and blouse. It can be found in volume 1 of the Dolly Bureau series. The Momoko pictured is Beach Rodeo. She is also wearing glasses by Randall Craig. The book is still in print and you can make the outfit too! See below for more details. Check out more patterns and dolly crafts in Dolly Bureau volume 3 on Etsy and Amazon. Keep up with all the fun Dolly Bureau books and surprises on Instagram Twitter, Facebook, and Pinterest pages.